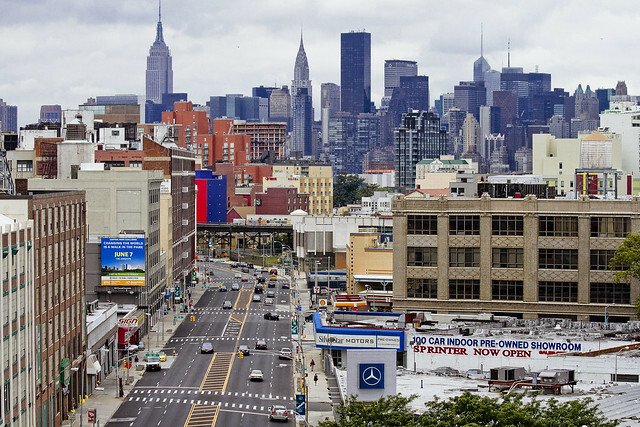 This is LIC’s 41st street, between Northern Blvd. and 36th avenue, west side. The two shopping carts you’re looking at in the shot above have remained, unmolested, in this spot for more than a year. I know this because I walk past them on an almost daily basis. Not long ago, it occurred to me how long it is that they’ve been chained to this DOT owned sign post pole, and just how unusual that is. 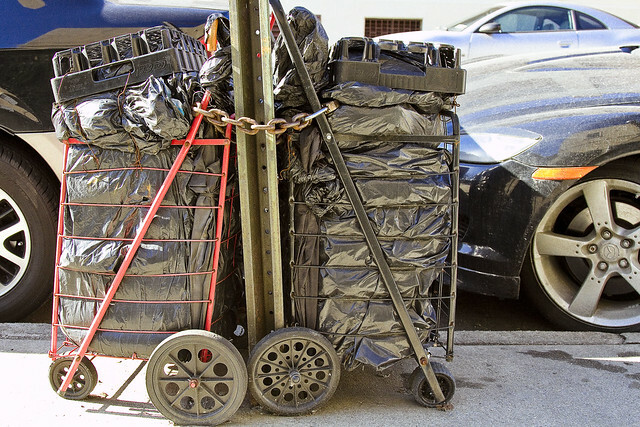 The City normally clips the chains of things attached to their property, and at the very least a Sanitation Inspector has been down this block at least once every couple of weeks. 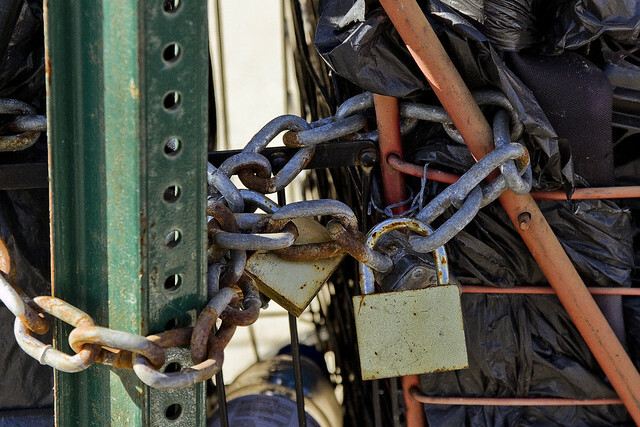 The carts are stoutly secured to the pole, with a galvanized chain and a heavy commercial grade padlock. By commercial, I mean the sort of case hardened unit you see securing the steel gates of shops. 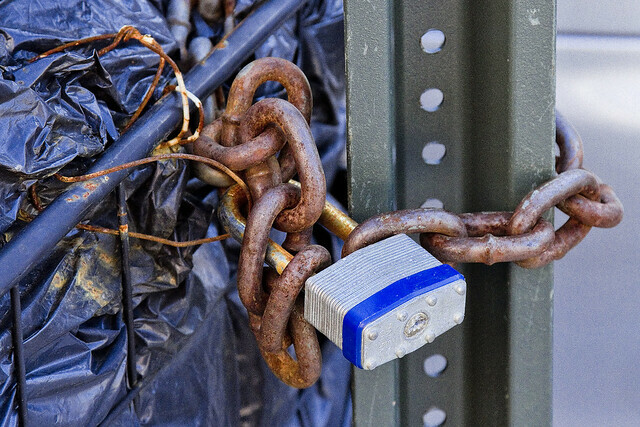 Locks like these will run you anywhere from $10-30 – depending on make, model, and quantity. I’ve never bought a length of chain, so I couldn’t comment on the price of that. 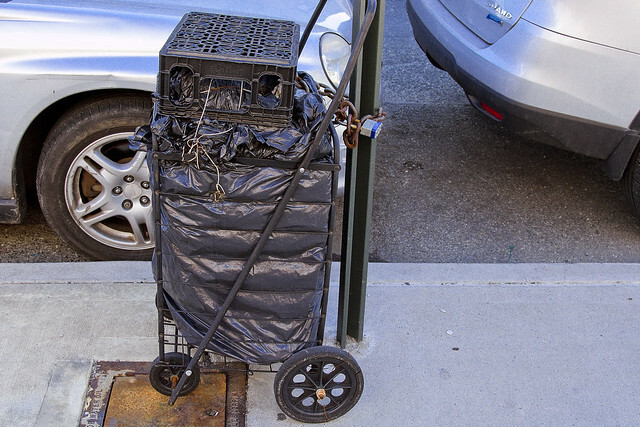 Shopping carts in Astoria are in the $20-30 range. That means that between lock and cart, you’ve got $50-100 bucks chained to this pole, and it has been for more than a year. 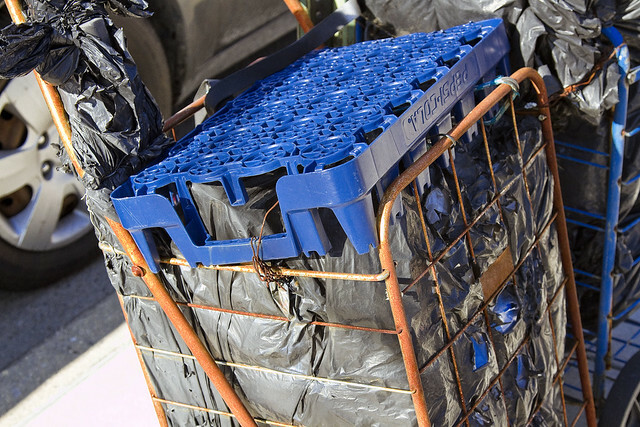 On top of the carts is a piece of beverage tray plastic, wired securely to the top of the things. 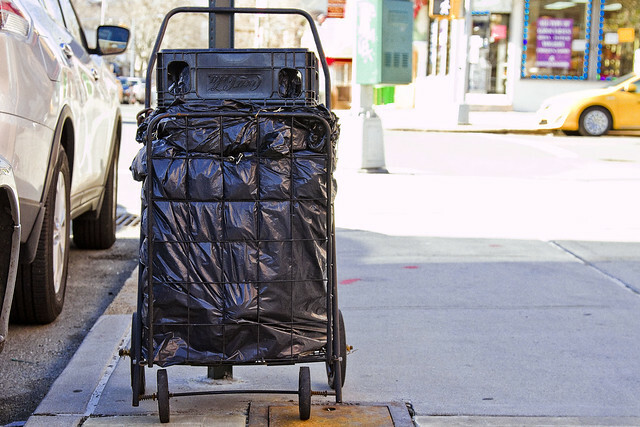 The black bags in the carts are “3 mil contractor” bags, and if you probe them with your finger – there are no bottles or cans inside. Instead, you’d feel about an inch of foam and behind it a hard shelled case of some kind. 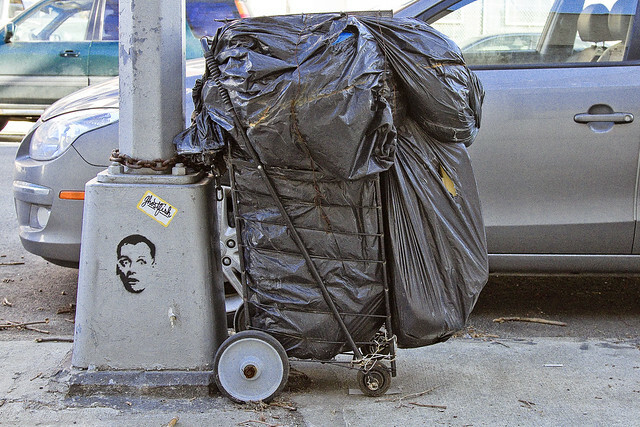 It’s odd, but there’s a lot of odd things you’ll find in Queens. 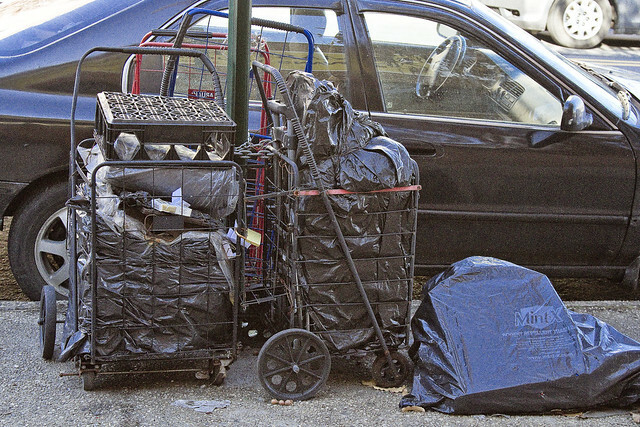 Steinway Street at the northeast corner of 36th avenue is where you’ll find another one of these assemblages. 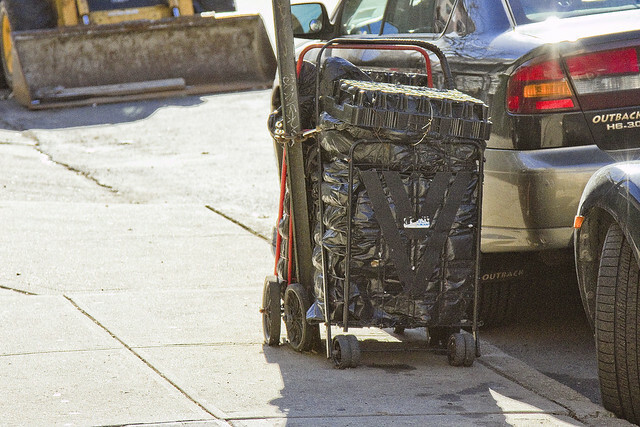 Same thing as the one on 41st – tightly folded up contractor bags perfectly filling the entire cart’s volume with a layer of foam and a hard shell hidden within. This is “weirdness” cart number two. Beverage tray is secured to the cart, with wire that is tightly twisted in a manner suggesting the use of pliers. It’s odd, I tell you, odd. This is “weirdness” cart number three. 36th avenue, south side, at 38th street is where you’ll find it. Around the corner, at 38th street’s east side, at 36th avenue. Foam, hard case within, contractor bags tightly wrapped. 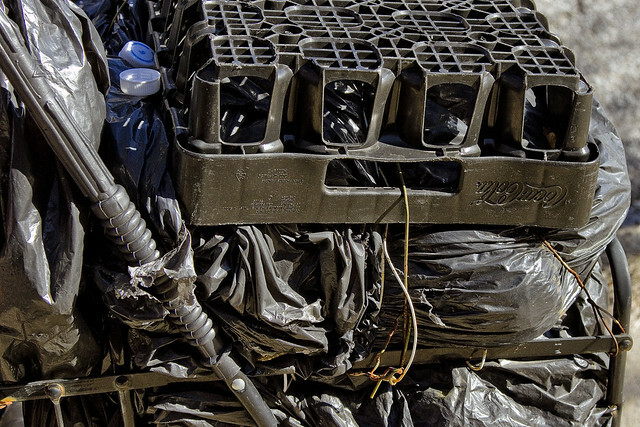 You’ll notice some blue material showing through, which was actually TYVEK – the same plastic fabric that construction tarps and COSTCO bags are made of. Can’t say if this stuff was in all of these carts, but… odd. This is “weirdness” cart number four. 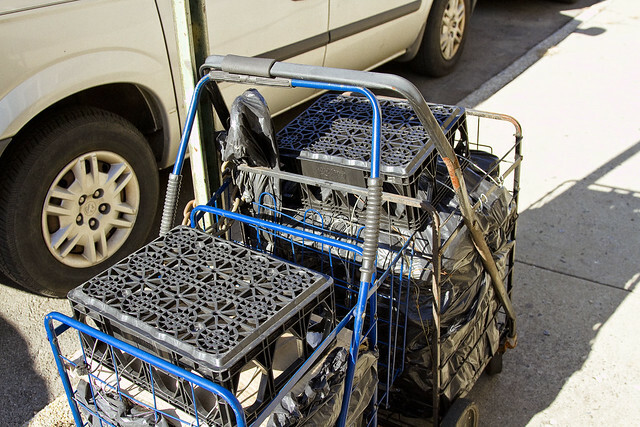 Beverage tray wired securely to the cart, twisted tightly. 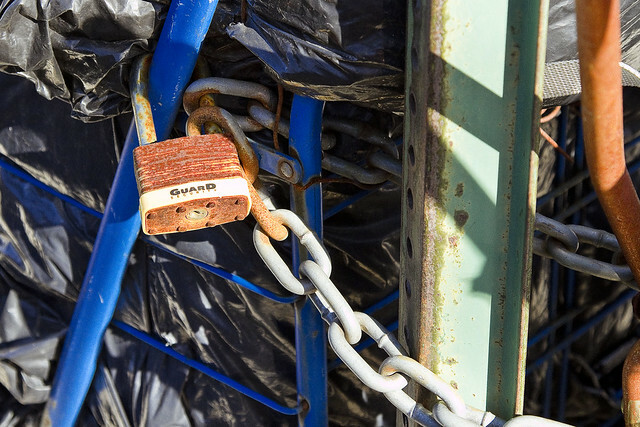 Expensive lock and galvanized chain. This is “weirdness” cart number five. 36th avenue, north side, at 37th street. This one has a wire grill attached to the top, but it too is wire tied to the cart. Again, finger probing of the black bag revealed not bottles or cans, but instead the now familiar foam padding around a hard case like interior. This is “weirdness” cart number six. 37th street, east side, at 36th avenue. 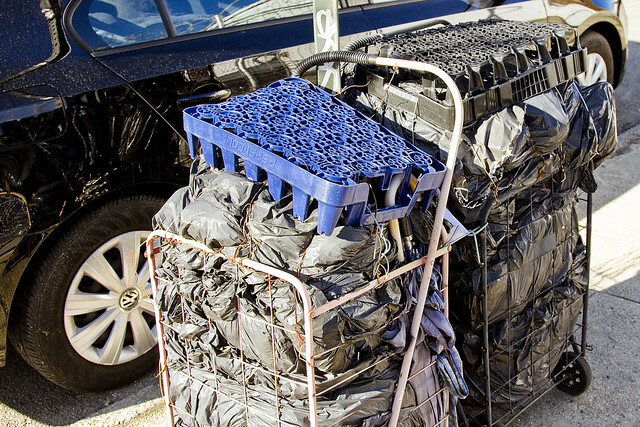 The arrangements of these carts became increasingly regular. Always at the same relationship to a corner, chained to the first sign pole on the block. The beverage trays were securely tied off, the foam and hard interior shell present, and so were the heavy chains and expensive padlocks. 36th street, east side, at 36th avenue. While photographing this one, I got a “hey, whatcha taking pictchas of” comment from a fellow leaving his house. We chatted for a moment and he said this cart had been in this spot for more than a year. Most of these carts were arrayed along 36th avenue, I should mention. I should also mention the abundance of subway tunnels which are directly below. 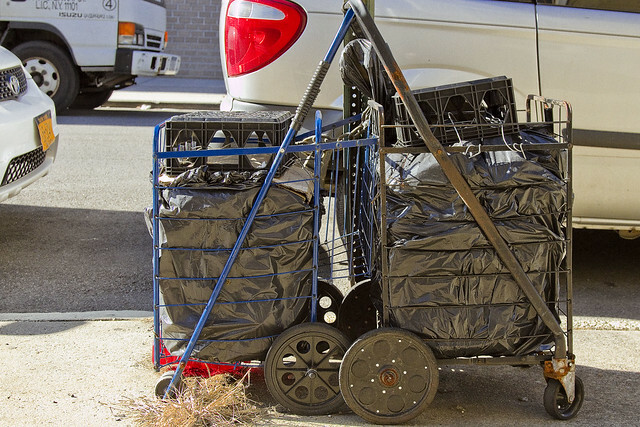 I continued my little survey, but the carts were not found anywhere beyond 35th street. I decided to head down towards Northern Blvd. This is “weirdness” cart number seven. This is “weirdness” cart number eight. 35th street, west side, between 37th avenue and Northern Blvd. This one was a little bit different, lacking a beverage tray on the top, but in all other aspects it was the identical setup with a padded case of some kind and the heavy chain with expensive padlock. Wandering back towards HQ, on Northern Boulevard, north east corner, at 42nd street. Same setup, with beverage trays and so on. This is “weirdness” cart number nine. 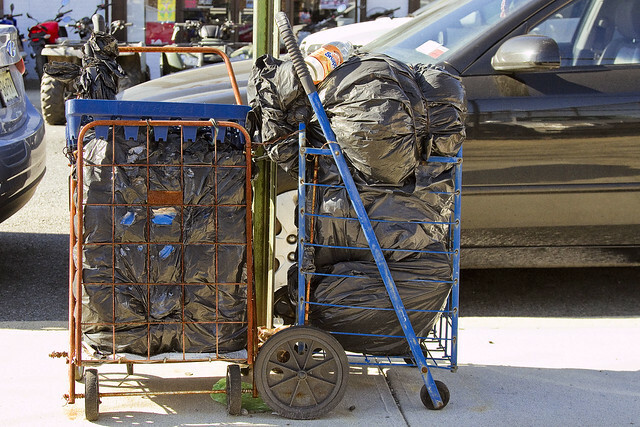 These carts on Northern at 42nd had a bit of garbage stuffed into them, but anything you leave on the street in Queens will soon turn into a trash can. 35th avenue, south side, at 43rd street. Again, same setup. 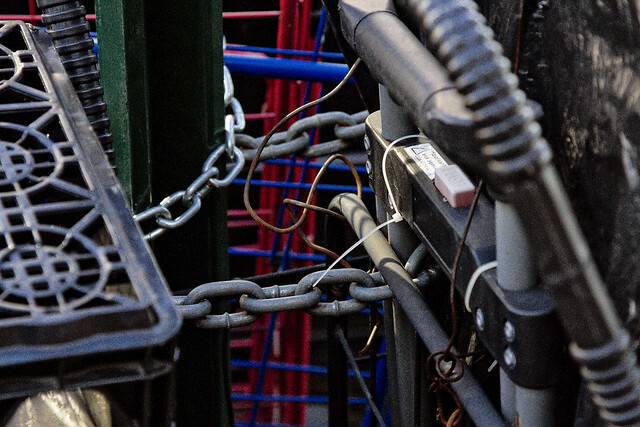 There were a couple of empty carts sitting alongside the two chained up ones. This is “weirdness” cart number ten. The whole affair was being held together with the now familiar wire tie offs. 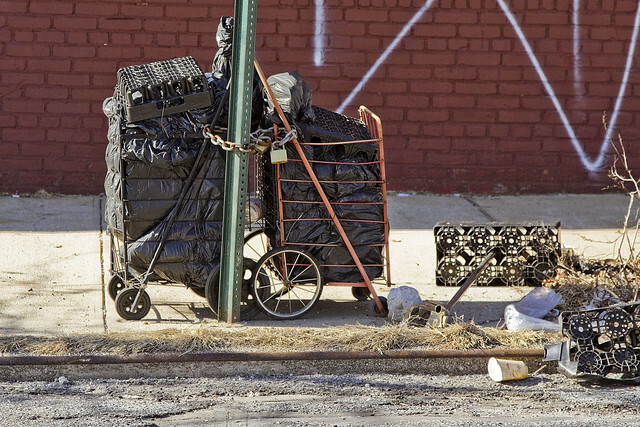 Or – There’s a bottle and can collector – hereabouts – who uses high end padlocks, steel chains, layers of water tight contractor bags, TYVEK, foam, and a hard shell case that perfectly fits into a shopping cart to protect his ten caches of bottle deposit returns which are kept only in areas which are over subway tunnels. Speculation is a silly thing to engage in. This cart business isn’t just odd, it’s downright weird, and my “spidey sense” is tingling for some reason. Several of these all set up the same way sounds like some art project. Anything nefarious would have done something long ago. 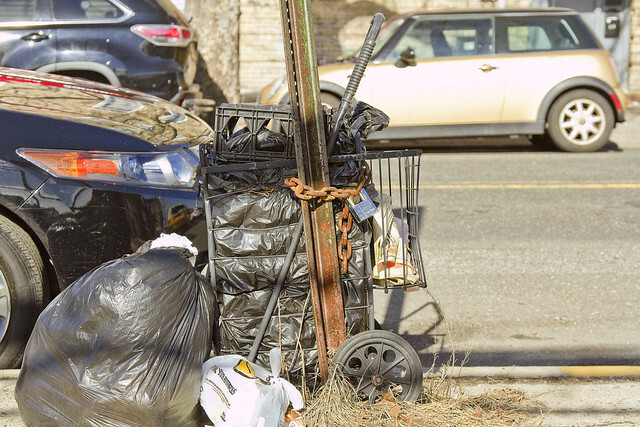 A homeless person’s stuff possible but not likely (they wouldn’t just let it out of their sight that long) unless they’re well organized as well as obsessive-compulsive about making all the shopping wagons look the same then simply abandon them. 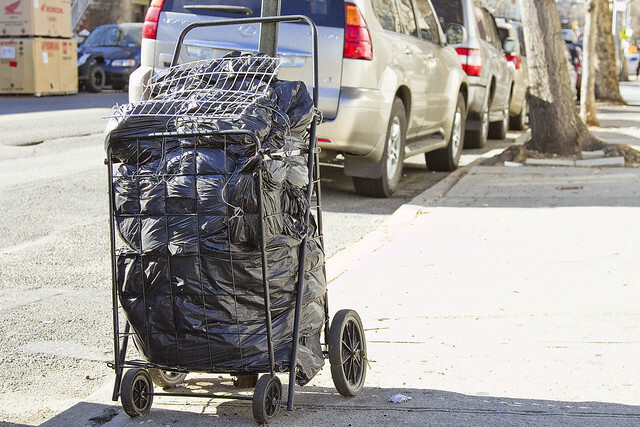 FWIW, in the summer of ’14 I saw an older woman slowly moving a dozen or similar-looking carts up 11th/12th avenue in Chelsea – it was notable because they were strung out over the length of a block, and she was slowly moving the hindmost cart to the fore a block ahead, and then repeating the process in a slow crawl uptown. 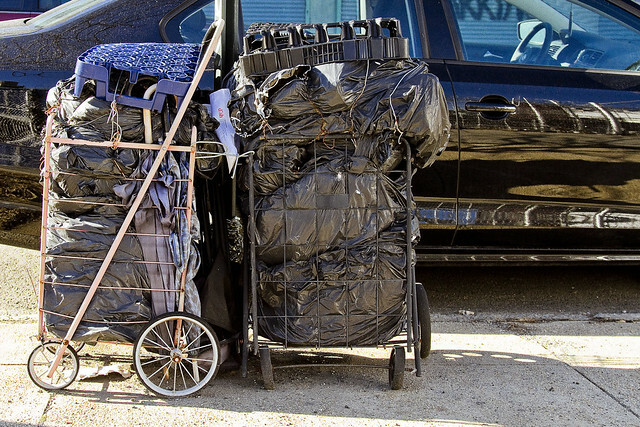 No idea if these are the same carts/owner, but the explanation could be simply that if you knew you were becoming homeless, but still had a small amount of funds, a strong desire to hold onto as much of your belongings as possible, and perhaps not the soundest judgment, this could be conceived as a way to do so. I wonder if a migration to Astoria was in progress via subway (locking the carts at the furthest end), when something unfortunate happened to stop it. How’d you get the aerial views in the last 2 pix? A drone? 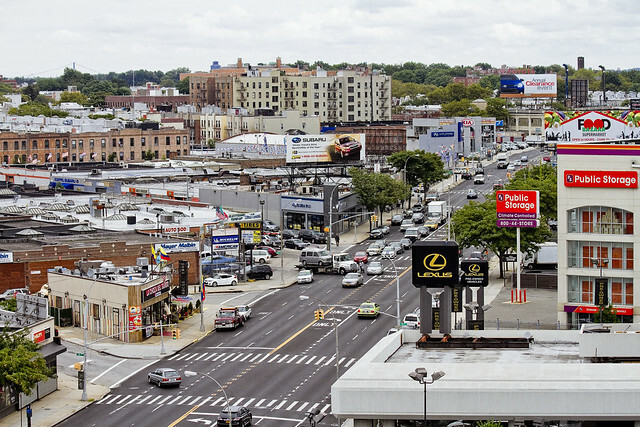 I can see the next to last shot taken from that vantage, but the very last shot seems you’re not on the building but hovering over the north side of Northern Boulevard. Over Western Beef? What am I missing? Also, the Standard Motors Building let’s anyone up on the roof or did you get special permission? Nope, you can visit the Brooklyn Grange rooftop farm any given Saturday during spring and summer. Surprised you haven’t, views from up there are awesome. Don’t forget the Standard building has that angled bend built into it.